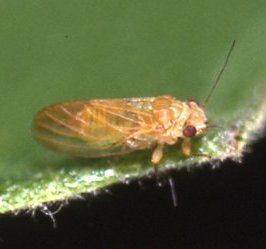 This site is an ongoing project to present and summarize general information about psyllids, their biology, host plant associations and the economic and ecological impact that pysllids have on man-made and natural environments. It also presents specific research on psyllid faunas in different parts of the world. Psyllid fossils have been found from the early Permian before the angiosperms evolved. Thus, psyllids may have primitively fed on gymnosperms, or even lycopods (Hodkinson, 1980). The explosive radiation of the angiosperms in the Cretaceous was paralleled by a massive radiation of associated insects, and many of the morphological and metabolic characters that the angiosperms exhibit may have evolved as defenses against herbivorous insects. Primitively, insects were probably saprophagous with a shift to the more complex lifestyle of herbivory, a secondary adaptation (Mitter, Farrell & Wiegmann, 1988). Allocation of resources in plants can vary seasonally, within an individual plant, between individuals, and from species to species. An example of this is the phenological changes in chemical profile of flowers, leaves, stems, and fruit for the legume species, Adenocarpus (Greinwald et al., 1992). The changing character of an individual plant is a complex and challenging landscape to herbivorous insects (Wink, 1992). An insect that attains an adaptive peak on one plant species is likely to be in an adaptive trough on another species (Janzen, 1979). Insect/plant interactions have been important in defining models of coevolution and cospeciation. In the Canary Islands metapopulation structures combined with local variation in host plant ecology and habitat/island fragmentation may support Thompson’s ‘geographic mosaic theory of coevolution’ (Thompson 1994; Gomulkiewicz et al. 2000; Thompson & Cunningham 2002; Percy 2003). However, in many cases it is believed that herbivorous insect speciation is sequential in relation to the host plant (Jermy, 1976; Menken, 1996; Percy et al. 2004). Plant/insect interactions have been important in contributing to the debate on coevolution. Thompson (1994) challenged the conventional co-speciation model in his book ‘The Coevolutionary Process’ pointing out that - interactions between plants and insects may not result in fixed traits in species that can then be mapped onto a phylogenetic tree, but instead there may be a shifting geographic mosaic, combining differences in the physical environment and the local genetic and demographic structure of populations. So that plant/insect interactions may involve localized coevolution, that is not taken into consideration by a strict model of pairwise species for species coevolution. Gomulkiewicz, R., Thompson, J.N., Holt, R.D., Nuismer, S.L. & Hochberg, M.E. (2000) Hot spots, cold spots, and the geographic mosaic theory of coevolution. American Naturalist 156,156-174. Greinwald, R., Bachmann, P., Witte, L., Acebes-Grinoves, J.R. & Czygan, F-C. (1992) Taxonomic significance of alkaloids in the genus Adenocarpus (Fabaceae-Genisteae). Biochemical and Systematic Ecology 20, 69-73. Hodkinson, I. D. (1980) Present-day distribution patterns of the holarctic Psylloidea (Homoptera: Insecta) with particular reference to the origin of the nearctic fauna. Journal of Biogeography 7, 127-146. Janzen, D. H. (1979) New horizons in the biology of plant defences. In Herbivores. Their Interaction with Secondary Plant Metabolites. (ed. G. A. Rosenthal and D. H. Janzen), pp. 331-350. Academic Press, New York. Jermy, T. (1976) Insect-host-plant relationship - coevolution or sequential evolution? Symposia Biologica Hungarica 16, 109-113. Menken, S. B. J. (1996) Pattern and process in the evolution of insect -plant associations: Yponomeuta as an example. Entomologia Experimentalis et Applicata 80, 297-305. Mitter, C., Farrell, B. & Wiegmann, B. (1988) The phylogenetic study of adaptive zones: has phytophagy promoted insect diversification? The American Naturalist 132, 107-128. Thompson, J. N. (1994)The Coevolutionary Process. University of Chicago Press, Chicago. Thompson, J.N. & Cunningham, B.M. (2002) Geographic structure and dynamics of coevolutionary selection. Nature 417, 735-738. Wink, M. (1992) The role of quinolizidine alkaloids in plant-insect interactions. 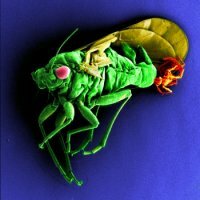 In Insect-Plant Interactions, vol. 4 (ed. E. Bernays). CRC Press, Boca Raton.